Internship | Wanted -> Program alumni! Help us find those missing! Wanted -> Program alumni! Help us find those missing! Recently, the program conducted a census of the program's 220 alumni. To date, 70% of the alumni (n=154) have responded to the survey. As illustrated below, this means 66 individuals are on our most "Wanted" list! If you are an alumnus and did not complete the census survey, we’d love to hear from you! If you know other program alumni, ask them if they have filled it out! Our goal is to reach an 85% response rate! 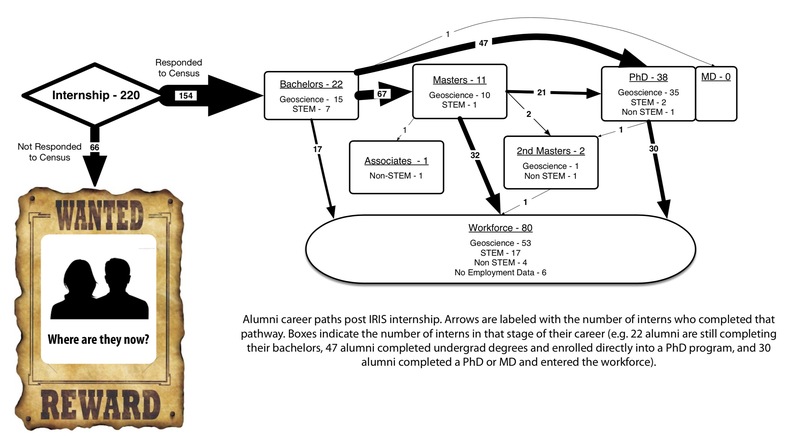 A preliminary analysis of the existing data illustrates that for many alumni, the IRIS internship experience was very influential or influential on their educational/career trajectories (81%). The academic pathways of the program alumni shown below, reveals that just over 75% of our alumni are pursuing advanced geoscience degrees and/or are employed in a geoscience career.